What unreleased game of 2019 are you most looking forward to? There's plenty to choose from. - What is the least bad videogame movie? It's tempting to start looking ahead to 2020 now that we know it'll have Vampire: The Masquerade—Bloodlines 2 in it, and possibly Cyberpunk 2077 as well. Maybe. But there are still over nine months of 2019 to go, so let's not get ahead of ourselves. This year still has heavy hitters like Doom Eternal, Dying Light 2, Control, and Total War: Three Kingdoms to look forward to, as well as long-awaited PC ports like Journey and the Master Chief Collection. Indie games like Hollow Knight: Silksong, Untitled Goose Game, and Witchbrook have the potential to shake things up, and I only just remembered while writing this sentence that Wasteland 3 is coming too. And that's just scratching the surface. What unreleased game of 2019 are you most looking forward to? We still don't know much about Respawn's Jedi: Fallen Order, which is being fully revealed next month, other than that you play as a Jedi in the period following Revenge of the Sith. Chris Avellone worked on the story, too, which is always a plus. Yet that's more than enough information to imagine what the game will be like: Respawn's smooth character movements, supercharged lightsaber duels, Jedi powers that mimic the feel of abilities in the Titanfall games. I'm hoping this is as imaginative and memorable as Titanfall 2's singleplayer campaign, but about twice as long. That'd suit me just fine. Hate to say it, but the last few years have been a quiet period for pure platformers, if you exclude more combat-focused stuff like Dead Cells. Celeste was wonderful but is fading from memory, and Hollow Knight and Cuphead don't serve up the kind of 10-to-20-minute, jovial, unpredictable runs that Spelunky does. I'm jazzed about having a short-session game like Spelunky 2 that I can poke my head in and out of over the course of a year, making runs between stints in Doom Eternal or more serious campaigns. The notion of a Spelunky that's aware of all the good stuff that the previous game did, but zanier, filled with more secrets, and more complex, sounds incredibly appealing. Also: hello, there is a playable sloth, and some sort of rideable cave turkey stand-in for Yoshi? Sold. 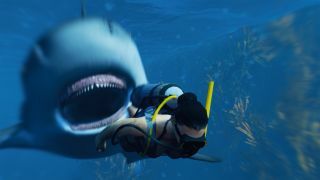 The open-world RPG where you play as a shark (SharkPG?) has been pretty much on top of my list since we first learned about it at The PC Gaming Show last year. It's a shark game inspired by Dishonored and Deus Ex, and that's immediately intriguing. You even start as a baby shark and have to survive and grow through your early life before you start taking down jet-skiers and sinking yachts. And when you create enough problems for those surface dwellers they send shark hunters are after you. Oddly (but thankfully) there's no hunger meter to fill. You can eat when and how (and who) you want. I'm looking forward to being the best shark I can be. Let me grab some popcorn as I await the salty tears of the anti-Epic Store crowd. I've long since stopped caring about what launcher I use for any particular game. I lost that battle back in the early Origin (aka EA Downloader, aka EA Link) and UPlay days, and with so many different launchers now available, I can't get angry at Epic for trying to carve out a bigger piece of the gaming pie on the back of its Fortnite success. But I am looking forward to the game, as New Vegas is still arguably the best of the Fallout series. Either way, The Outer Worlds should provide some good fodder for the comments. There's a chance Necromunda: Underhive Wars might come out this year, and I'm pretty stoked for Untitled Goose Game. But if I have to pick one it's Disco Elysium, the detective RPG that promises to do to the 1970s what other fantasy RPGs do to the middle ages: Strip-mine it for cool looks and locations, then let me walk through it talking to a bunch of engaging NPCs. Can't wait.